As I’ve mentioned before, the stock market was lifted to record highs by just a few stocks that have disproportionate weightings. We are talking about Apple, Facebook, Amazon, Netflix, Google and Microsoft, although there were others that helped along the way. Since those stocks are in nearly every technology index fund and major ETF, they can either be very helpful in a rally, or very heavy in a sell-off. We are experiencing the latter and its impossible to say when investor sentiment will turn back in their favor. The sector rotation out of growth and technology stocks and into value has been happening since August. It may get worse as we approach the end of the year since there are very few catalysts to change perceptions. After two-consecutive winning weeks on Wall Street, which included a nice rally at the start of November, the bears took back control of trading last week. Most of the damage was done early in the week, including a notable selloff last Monday, which saw the Dow Jones Industrial Average fall more than 600 points. Last week started with three straight losing days for the U.S. equity market before the bargain hunters returned over the final two trading days to pare the weekly losses. For the week, the Dow Jones Industrial Average, the NASDAQ, and the broader S&P 500 Index finished 2.2%, 2.1%, and 1.6% lower, respectively. 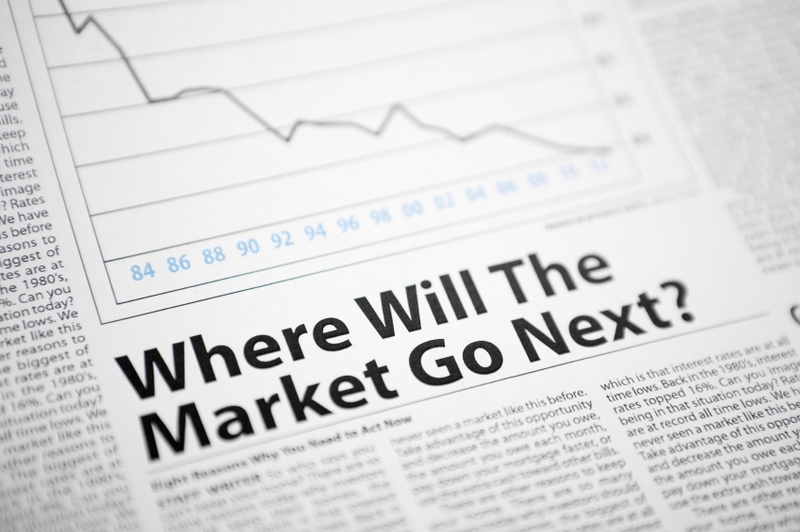 There are many variables in play for Wall Street right now, and we think some of the uncertainty arising has played a big hand in the spike in volatility this fall. Last week, the market was unnerved by a few events, most notably the signs that amicable Brexit deal stills appears far off. That has brought a good deal of uncertainty for the United Kingdom and the European Union. There were also continued worries about the health of Italy’s financial system; the ongoing global trade disputes and the effect it will have on the global economy; rising U.S. bond yields, and the impact such has on emerging market yields; and the recent slowing pace of GDP growth in China. The concerns about China’s economy, and the impact it will have on oil consumption has pushed crude oil prices into bear market territory, which is defined of a retreat of more than 20% from its most recent high. Not surprisingly, against this backdrop, it is easy to see why there has been a spike in equity market volatility. The CBOE Volatility Index (or VIX) rose more than 3% last week. The sell-off we have been experiencing, while painful, is not historically bad, by any means. The numbers are large, because, well… the numbers are large. We’ve had multiple market records over the past two years, so a 10 percent decline looks bad, smells bad and feels bad. Around two-thirds of the stocks in the S&P 500 are in a correction, and about one-third are in a bear market today. The index itself is flat for the year, which is a function of the performance of a select few stocks that outperformed in the first half of the year. 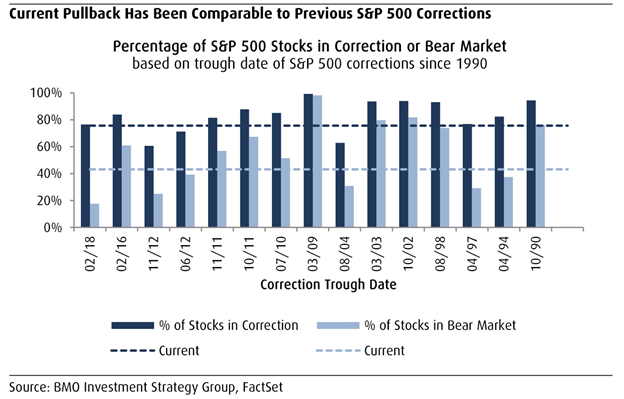 The BMO Investment Strategy Group ran the numbers from the last correction back in February and showed that even fewer stocks entered bear market territory, although more stocks were in a correction. Every correction going back to 1990 was far worse, except for November 2012, June 2012, August 2004 and April 1997. This is not to say that this selloff won’t get worse and turn into a full blown correction or bear market. We can’t predict that one way or the other. It’s just important to keep this perspective when we have days like today and last week when all we see is red.